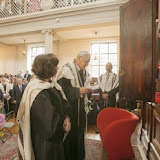 On 24 June 2012 Rabbi Marianne van Praag was inducted in her congregation LJG The Hague in a festive setting and with much music. the ceremony was attended by seven colleagues, the rabbinical students, a number of Jewish and non-Jewish dignitaries and a large number of enthousiastic LJG-members. Click here or on the photo to to to the photo gallery. Click here to see the booklet (without the cover) with the program and the service.